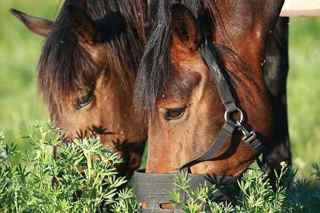 A Grazing Muzzle: An Answer to Your Horse Weight and Laminitis Problems? 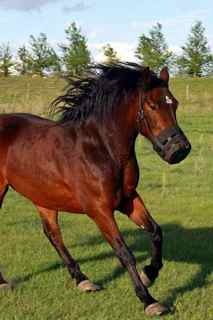 The most wonderful thing that we found about using a grazing muzzle on our horse Comet, was that he was free to run, play and graze whenever he wanted. It truly is a horse diet on the go! He could stay with the herd, and graze all spring, summer, and fall. Horses are herd animals, and need to be with each other for comfort and both physical and emotional safety. Knowing this we didn’t want Comet to be locked in a small paddock away from the other horses, just because he had to lose weight. Why is Horse Weight so important? And why did we start using one in the first place? 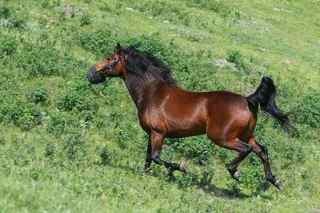 Well our horse Comet was extremely overweight when we acquired him. So much so that his very life was at risk. How so? 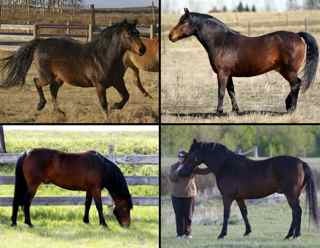 Horses who are overweight are much more likely to develop horse laminitis, and other dangerous conditions such as insulin resistance. Check out our page of Horse Laminitis for more information! Comet was in suffering from serious hoof pain much of the time, and our equine veterinarian told us that if we wanted to save our horse he needed to lose a substantial amount of weight. It was late winter and the horses were still eating hay, so we cut back his rations drastically. But we had to think of a way to keep him on a restricted diet once the new green grass started to grow in the spring. We were trying to think of how we could rearrange fences, and rip out grass to make a dry lot for him. We were willing to do anything, and luckily the owner of the property we boarded at was fairly easy going, so we knew he wouldn’t mind if we had to set things up a bit differently. What is a Horse Grazing Muzzle? To me, and to Comet, a horse grazing muzzle is a miracle horse diet! I had never heard of them until early last spring when our natural hoof trimmer suggested we try it! We went and picked one up that day, and never looked back. There are several styles available, but I really love the kind she recommended. It is a mesh basket with a thick rubber base with a hole about and inch around cut in the bottom. It is attached via the built in break away halter...a great feature if your horse gets it caught in a fence or a tree when you’re not around. It does up with two layers of very strong velcro, but not so strong that the horse couldn’t get it undone in an emergency situation. There is also a little clip, just like on a standard nylon halter so that you can take it off without having to undo the velcro every time. This is a great feature because you’re not always ending up with mane hair in the velcro! Amazing results! Within just a couple of weeks of using the grazing muzzle we could see changes! Without the grazing muzzle it would have been extremely difficult for us to help Comet lose the weight, and begin his journey towards sound healthy hooves! Some grazing muzzle tips to help you get started! don’t worry about your horse starving...he will figure it out fairly quickly! Here Comet is racing up the hill towards the water. He loves to move, and the combination of eating less, and moving more is exactly what he needed to help grow in new, healthy hooves. In the years before we got Comet, he was free to eat as much as he wanted, and that resulted in recurring cases of horse laminitis. He was never crippled to the point of being immobile in a founder stance, or laying down for hours, so his previous owners didn’t know anything had ever been that wrong with his feet. His hoof wall was separated from the internal hoof structures. His feet were hollow sounding, with almost no sole depth, and he was suffering from excruciating hoof abscesses every few weeks. The added weight on his separated hoof walls was causing them to further separate. Eating a rich diet, like lush green grass causes metabolic disturbances in the hoof, and the laminae that attach the hoof wall to the internal structures of the hoof become inflamed and weakened, making it even easier for wall to stretch away. We learned through our research that there is NO WAY to fix a hoof once it has suffered from an episode of laminitic inflammation. The only way to help your horse is to stop it from happening again, and to give your horse time to grow in healthy attached hoof walls. This can take about eight or nine months. Imagine badly injuring and subsequently losing a fingernail. You just have to wait for your body to grow a new one. Lots of movement will stimulate the hoof horn growth, so the more a horse is able to move, the quicker the hooves will grow! And it goes without saying...but I'll say it anyway...more movement means faster weight loss and a stronger healthier horse! We are so happy that Comet has grown in health new hooves, but we certainly don’t take it for granted. At the first sign of new spring grass, (one of the primary causes of laminitis) his grazing muzzle will be going back on. All horses are at risk of laminitis, but horses who have suffered in the past are at an elevated risk!